We are the oldest retailer of futons in the United States. Our secret? Offering quality products, friendly and knowledgeable service, style, selection, and value. Temple Slug also carries a selection of quality waterbeds and supplies as the oldest waterbed retailer in America. 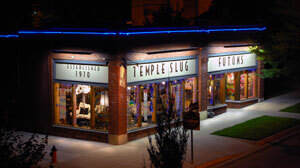 Established on April Fool's Day in 1970, Temple Slug has grown from its origins as a hippie shop and waterbed retailer to offer a modern selection of futons, home furnishings, decor, gifts, incense, oils, candles, and greeting cards with appeal to traditional and multicultural tastes. We still operate out of the same building and under the same ownership as an independent business. We still have our original customers, their grandkids, and all the new friends we have made over the years. Word of mouth has been our best form of advertising. During the 1980s some Bostonians pioneered American adaptations of an old sleeping surface from Asia -- the futon. We began selling the New Moon mattresses and William Brouwer's convertible frame which transformed from sofa to bed. Those companies are no longer around, but we sought other manufacturers who shared our philosophy of producing quality products. Today we are the oldest futon retailer in America. Futons are our principal business. People have been sleeping on cotton-filled mattresses for thousands of years. In the cradle of civilization, the ancient Babylonians, Mesopotamians, and Egyptians all used cotton as a bedding material because it is very comfortable -- it has good loft or springiness to support the body; it breathes, which helps control temperature (keeps cool in summer and warm in winter), and it's easy to produce. Silk and wool also have similar properties and have also been used for a long time as bedding materials. The word "futon" comes from Japan and means "bedding". The Japanese use the word "shikibuton" to describe the actual mattress portion of the bedding -- the part we now call "futon". Japanese futons are quite a bit different than what we are used to in America. They are quite thin, two to three inches, and are made primarily of long staple cotton, the most expensive part of the cotton ball; long staple cotton is the most valuable part of the cotton ball because it is usually spun into thread to make clothing. This long staple cotton doesn't have as much loft (i.e. isn't very fluffy) as other parts of the cotton ball, but it has strength and integrity, so the thin cotton batting in the mattress won't pull apart and get lumpy. Each year, they return their bedding to the "futonier", who removes the covers, washes the cotton, and then remakes the shikibutons and covers. The Japanese traditionally roll out their futons on their tatami mat floors every night to sleep, and roll them back up in the morning because space is such a premium in their small, crowded country. The tatami mats are not hard like wooden floors, and so offer a little bit of "give" under the thin futons. Tatami mats are pads made of rice straw, about two inches thick, and come in standard sizes -- about two feet wide by six feet long. The floors in traditional Japanese houses are covered from wall to wall by tatami mats, much like wall-to-wall carpeting (the Japanese often measure the size of a room by how many tatami mats it holds). People remove their shoes before entering the house, and the tatami is soft under the feet. It protects the floors as furniture is moved about to suit the family's activities at different times of the day. During the 1970s a furniture designer, William Brouwer, was convinced that this sort of adaptability would work well in America as well, especially in small apartments in the Boston area where he lived. Hide-a-beds, the principal form of convertible beds at the time, were uncomfortable and difficult to move and convert. Futons were comfortable and easy to move about in the daytime. They needed adaptations for American habits however. We prefer sleeping and sitting up off the floor. And we would not want to pay hundreds of dollars for a thin cotton mattress that needed washing each year. Hence he designed a bedframe which looked much like a standard-height bed. However, it was made in three parts which would slide together to convert into a wide chair or couch. This Brouwer bed -- which won a prestigious national design award -- was elegant, modern, and superbly crafted of fine woods, with wood slats to support the mattress. Futon makers in the Boston area created mattresses using layers of the shorter, less expensive but curlier (i.e. with greater loft) linter fibers taken from closer to the center of the cotton ball. They were twice as thick as the original Japanese shikibutons. Soon people in other parts of America and around the world were designing other variations of "tri-fold" frames like Brouwer's, and "bi-fold" frames that looked more like conventional couches. With the passage of time, it became apparent that this wooden furniture lent itself to the styles of the Arts and Crafts Movement which began in nineteenth century England under William Morris and spread to America via the Stickley Furniture Company and other designers and purveyors of "Mission" furniture. The best of today's futon frames are in that tradition. And the zip-on upholstery covers for futon mattresses have evolved into hundreds of choices from designer fabrics. For many people, however, their first contact with futons comes from another direction. Some manufacturers see the potential not for versatile furniture to use in fine homes, but for cheap furniture to mass market. They target students and people who wanted temporary "throwaway" furniture. They import frames made of uncured tropical woods or particle board by low-paid workers without quality controls, using staples, biscuit joints, and other inexpensive manufacturing techniques. Instead of using sturdy ticking materials and fully-looped tufts to wrap the futon, and high-loft staple cotton inside, they use muslin ticking, shoot-though tufts, and "picker" cotton (i.e. dust from the cotton mill ginning floor) with absolutely no loft. People who purchase this furniture pay little for it, but find it uncomfortable, prone to falling apart, as well as hard and lumpy. Adding individually wrapped springs speeds that process as they turn sideways one-by-one. People who bought quality frames and mattresses in the early period have a much different experience. Many of those original frames are permanent fixtures in homes, and it is not unusual for us to find people who have been using their mattresses a decade or longer (though with some loss of their original resilience, we would imagine!). Today, mattresses have evolved. Even the best long staple organic cotton packs down over time. Sleeping-grade mattresses have moved away from cotton toward materials that do not pack down -- especially fluffy polyesters and high-density (i.e. weighing 2 pounds per cubic foot or more) foam. By packing these in various combinations one can create many different degrees of "cushiness" while still providing good back support. These mattresses will keep those qualities for many years. The uses for futons have also evolved. People who wish to use a guest bedroom for a home office will find futons that convert from chair or sofa to chaise lounge under normal use, but become instant beds when guests arrive. Many people use futons on porches, in family rooms, in dens, and in lofts. A futon loaded with pillows is a comfortable and attractive replacement for a daybed in an entrance cupola or anteroom. A bunk bed with futons can be converted into two low beds after the kids leave home, to follow them to college, or be used in a guestroom. In the bedroom, non-converting beds come in gracious styles, with matching dressers and side tables. Living room sofas come with matching converting chairs, end tables, coffee tables, and accent tables. Pillows come in many shapes and sizes. And futon covers, window curtains, duvets, shams, and other accessories can be made to match. A group of people in San Francisco during the late '60s were going to open a flea market in an abandoned trolley station in the Russian Quarter. Since the station had a big domed roof, they were going to call it "Temple Slug." They never opened the market, so rather than waste a great name, we adopted it. Soon our customers were just calling us "The Slug". Three months later someone drove up to the front of our store with a plastic sack filled with water. People in California were sleeping on this "water bed." We bought some boards at the lumberyard to build a box around it and placed it in the black light room of our basement. Soon people were coming from surrounding states to try out this strange object. We approached the Kuss Company in Findlay, Ohio to design a water mattress with square corners and a better drain system. Vinyl Products quickly adopted a similar design. We set out to sell the best waterbeds at the best prices. Today we are the oldest waterbed retailer in continuous business, selling mattresses, heaters, linens, and other waterbed supplies.